The Sonoran Sky resort is one of the newest luxury resorts on Sandy Beach in Rocky Point. The Sonoran Sky has a full service spa, aqua bar, state of the art fitness center, water slide, beach front swimming pools, Jacuzzi and a convenience store. 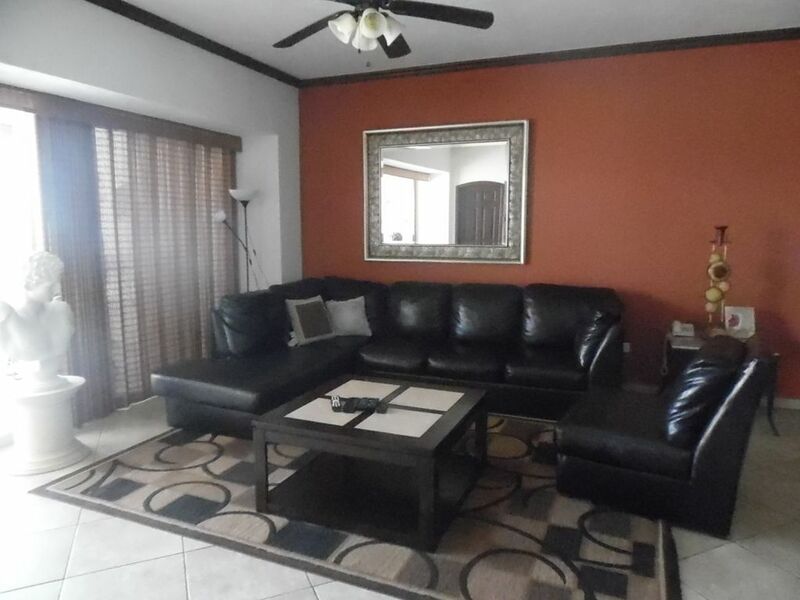 This beautiful condominium is located on the 4th floor of the Sonoran Sky Resort. This condo can accommodate 8 guests. Wow! Wait until you walk through the regal entrance of this beautiful condo! This condo has been furnished for those with discerning taste. The living room walls are painted bright orange and the sofa is a shiny black leather L shaped sectional that folds out to a bed for two of your guests. There is a lovely mirror on the wall behind the couch and three leather ottomans that can be used as a foot rest or a drink holder. There is a geometric shaped area rug and a large flat screen TV with a DVD, VCR and stereo system. The condo comes with free cable and wireless internet. To the left of the TV there is a decorative recessed niche with a floral arrangement and a cabinet below. The dining room looks like a page right out of Modern Home. The table is long dark wood with curvy white leather chairs. This table could easily seat six but there are additional chairs for more guests. The wall behind the dining table has an art piece painted of coconuts. The kitchen has dark wood cabinets, stainless steel appliances and granite counter tops. There is a built in wet bar with two bar stools and a wine chiller below. This kitchen was made for someone who knows what they are doing! You bring the food and we provide the parts to make it a gourmet feast. The master bedroom is furnished with a king size wood canopy bed with a matching suite of furniture which includes bed side tables, dresser and a sitting chair. Across from the bed on top of the dresser there is a TV and DVD player. The room comes with a large closet with mirrored doors and access to the terrace through the sliding glass doors beside the bed. The master bathroom has an elongated Jacuzzi bathtub, double sink vanity and a shower with a glass door enclosure. The commode is hidden behind its own privacy door. The 2nd guest suite has all orange walls and a king size wood framed bed with a beige and silver bed spread. The room comes with a lighted bed side table and a dresser topped with a TV and DVD player. The room has a huge closet and an attached private bathroom. The 3rd bedroom has a king size bed with a very unique patterned bed spread in shades of red and gold. The room has an art deco metal piece above the bed, a TV, DVD player and a huge mirrored closet. The terrace has been furnished with a rectangular dining table set to seat 6, two lounge chairs and a wet bar. This terrace will provide hours of relaxation and visions of the most beautiful sunsets you will ever see, there is no place on earth you will see this breath taking views, come on, you deserve this! This is truly paradise, Book your trip now!